DESCRIPTION: Cedar wood bay is situated in orofun village in eleko town before the free trade zone; it’s a property facing the road. 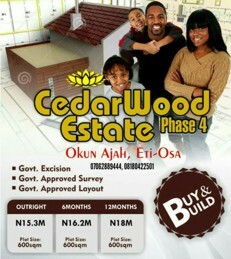 Cedar wood bay is just 25 minutes drive after ajah. The neighborhood is surrounded by built houses. 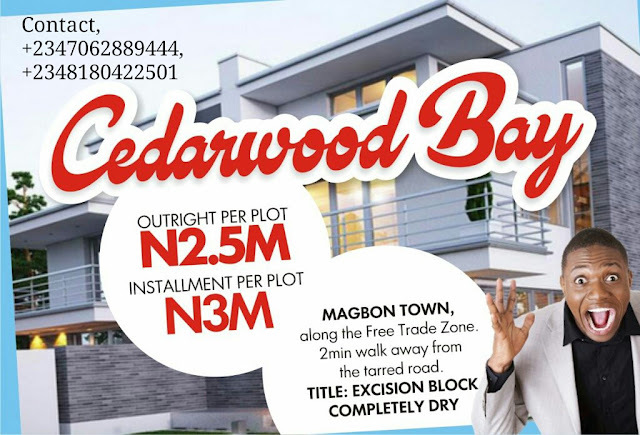 LOCATION: Cedar wood bay is located in magbon eleko town before the lekki free trade zone, ibeju lekki. LAND MARK : Free Trade Zone, Dangote Refinery, Eleko beach, Luxury Amen estate, a great resort. PROXIMITY: Cedar wood bay is few minutes’ drive to the Free Trade Zone, Dangote Refinery, Akodo General hospital, Amen estate, etc. it has a Registered Survey, Deed of Aassignment, Layout, and Government Excision. COORDINATES: 598166m E, 712997m N.
PROMOTIONAL PRICE: Cedarwood Bay is currently selling for 2,500,000 Naira on outright. 12MONTHS INSTALLMENT is 3,000,000 Naira, initial down payment of 300,000 Naira Spread the balance 2,700,000 Naira through 12 months that is 225,000 Naira. ALLOCATION DETAILS: you get an instant reservation after completing payment.